Balance of Color, explains the application of color balance and provides three color composition examples that achieve balance, using the color sphere. 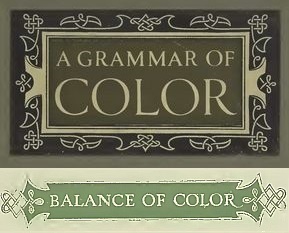 It is a section of the Introduction for the 1921 book, A Grammar of Color, written by A. H. Munsell. This book was published posthumously by the Strathmore Paper Company. The introduction includes sections on The Color Sphere, Balance of Color, and Unbalance of Color. We are presenting each section of the Introduction as well as the rest of the book as part of series of blog posts to make the entire text available online here in our Munsell Color Blog. The sense of comfort is the outcome of balance, while marked unbalance immediately urges a corrective. That this approximate balance is desirable may be shown by reference to our behavior, as to temperatures, quality of smoothness and roughness, degrees of light and dark, proportion of work and rest. One special application of this quality is balance which underlies beautiful color. The use of strongest colors only fatigues the eyes, which is also true of the weakest colors. In a broad way we may say that color balances on middle gray. Thus a moderate amount of extremely strong color may be balanced by a right quantity of grayer color; and a brilliant point of strong red will balance a larger field of the grayest blue-green. Thus AREA is another quality in color composition, which aids in the balance of Hues, Values and Chromas. Examples of this are all about us. The circus wagon and poster, although they yell successfully for our momentary attention, soon become so painful to the vision that we turn from them. Other examples are magazine covers and the theatrical billboard. These are all cases where color is used only to excite the eye but not for its permanent pleasure. In the case of this book of cover papers, the problem is to so soothe and please the eye that the attention will remain upon them and the applied colors, thereby enhancing the appearance of the paper chosen. The large truth is that general color balances approximately upon middle gray. Although the colors may differ greatly, yet their total effect is balance. Let us take a point upon the color sphere such as R5/5 . There are three distinct color paths for which this becomes the center. First a vertical path which extends from black through red to white; and in a decimal system is divided into ten equal steps. Equal departures either way from middle red must balance, such as R7 with R3, R8 with R2, R6 with R4, while the strength may be used so as to require equal or unequal areas of each balanced pair. The general law being, that the stronger the color we wish to employ, the smaller must be its area; while the larger the area, the grayer the Chroma. Thus R7/6 balances R3/3 in the proportion of nine parts of the lighter red to forty-two parts of the darker red. * In other words, these symbols will balance colors inversely as the product of their factors. This opens up a great field of area in the use of reds, where balance may be restored by changes in the factors of Value and Chroma. Thus the lighter red (R7/6) which we will call 42 balances the darker red 3/6 which we will call 9, by giving 42 parts of the darker (weaker) red to 9 parts of the lighter (stronger) red. A second path through Middle Red follows the equator of the sphere and again we may balance the Hues once or twice removed; as for instance, RP and YR or P and Y. These are called the neighbors of Red, popularly known as its shades. Instead of neighbors we may select the exact opposite of Red, Blue-Green, which is known as its complement, using equal areas if the colors are of equal strength or increasing the area of the weaker color. This second path does not depart from the level of the equator and therefore all the colors named are of a single Value without contrast of light and dark. A more interesting path is the third, which may be passed through Middle Red, being neither vertical nor horizontal; but inclined so that if it passes upward out of Red toward lighter Purple it will pass downward from Red into darker Yellow. These three examples must suffice as a brief introduction to almost endless examples of color series and color intervals that are orderly and harmonious to the eye. *There is a typo in the original book. It should read: Thus R7/6 balances R3/6 in the proportion of nine parts of the lighter red to forty-two parts of the darker red.